Anyway, when I saw it, I knew I had to have it! I bought my friend, Hani, one too, and she invited me to collaborate with her in making our mini gingerbread house creations. 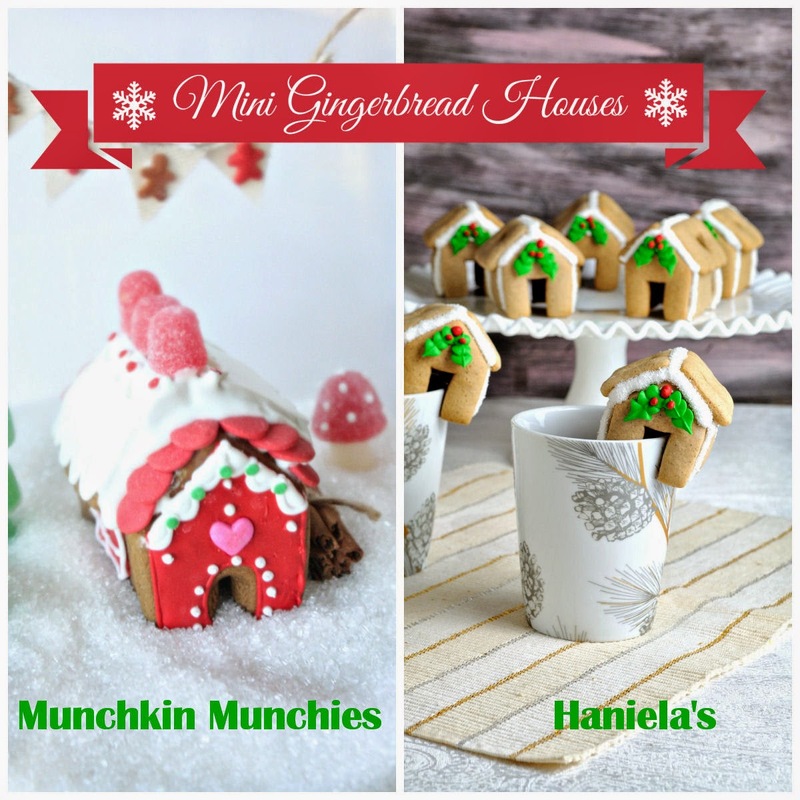 Haniela's makes amazing cookies, and one of her specialties seems to be gingerbread creations, which includes houses, whether they are mini and simple, or bigger and detailed (even 3D), they're always beautiful! I adore her "mug hugger" cookies for this collaboration! I decided to make a snow globe of sorts, but I had a bit of a difficult time photographing through the glass. I think I need a new camera and/or lens (I'll blame it on the equipment, haha)! So...I brought it out of the jar and made a little wintry scene in a mug. I can't believe that with all the photos I took of this mini house that I did not take any of the house in production!?! I used this gingerbread recipe and this royal icing recipe (white and tinted red, as "glue" and decoration). Jumbo confetti sprinkles were used for the roof awning(?) detail and gumdrops on the roof ridge. 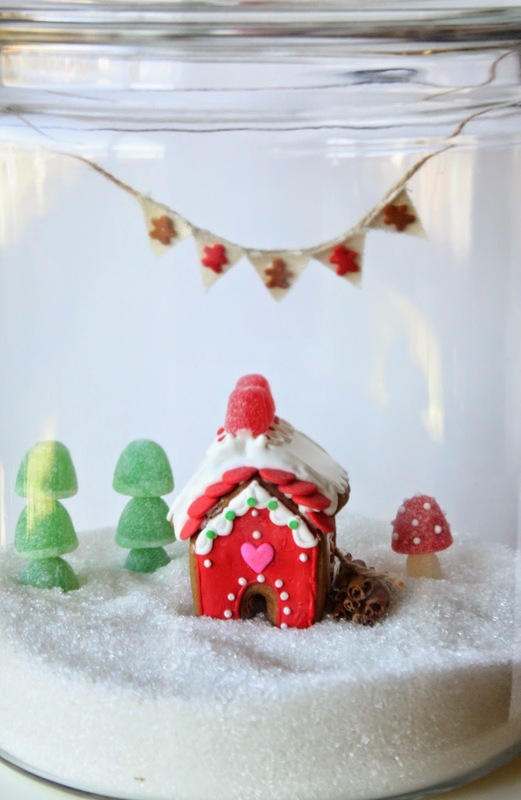 The toadstool is made with a jumbo gumdrop and a regular size gumdrop, also connected with a toothpick. The white dots are royal icing. The wood stack is cinnamon sticks, bound with twine. I also used small confetti sprinkles to decorate the house. I think this is about the cutest thing I've ever seen in my life! I need to get that cutter! Love how you make the little scenes, too, the banner is adorable! These are the cutest! I would love it if you shared this with Holiday Best at Tumbleweed Contessa. They are certainly "the best" I've seen. Thanks for your visit and your comment, Lita! Sue I absolutely love how these turned out. I love the colors you used, too. I Hope you have peaceful Holidays! Merry Christmas. Thank you for all you do and your friendship. Thanks for thinking of me and inviting me to do a joint feature of our mini houses! You're the best, Hani! XOXO. Merry Christmas, friend! SUPER CUTE! Who needs the step by step...the photos you staged are adorable! ;) I love these. Oh my gosh, it's just darling!! 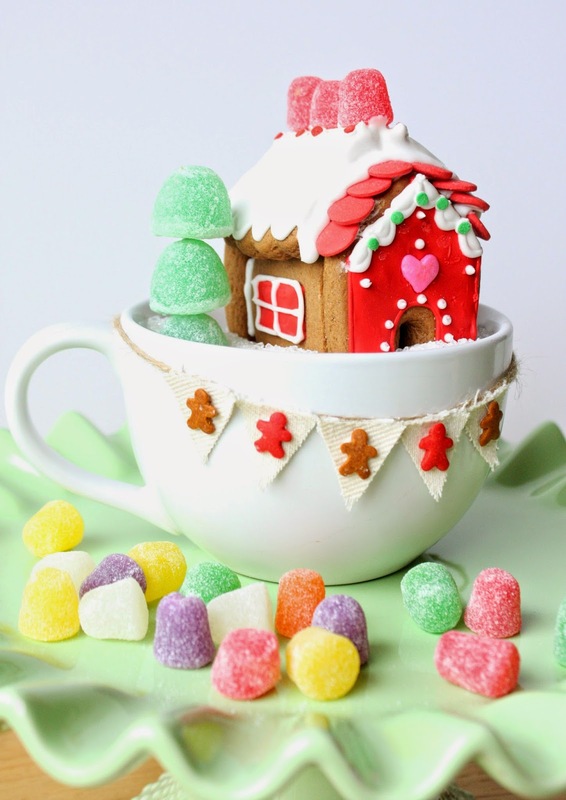 I love your colorful and itty bitty mug huggin' snow globin' gingerbread house! Side note: I just realized the comments I've been leaving on your posts haven't been showing up. Sad face! I'm not using Chrome (switched to Safari) and it seems to work here. The interwebs just keeps confounding me! lol. I always love to read your comments, Michelle! Sorry for the troubles! o my my my..these are so colourful and cute! You are so talented, Sue. These are absolutely adorable! I just found a mini gingerbread house cutter at Target. After seeing yours I can't wait to make some! Thanks for sharing! Thank you, Lisa. :) I would love to see your mini house(s)...Adorable, for sure! These are absolutely cute!!! Thanks for sharing. Thank you, Ursula! The one you made is as cute as can be! This is so adorable! I love mini cookies! Great job - both of you! Un petit message pour vous dire que j'ai tester et publier une recette de votre blog. Un grand merci les enfants ont adoré. Your cookies turned out so cute! Thanks for sharing. Wow Sue, I can't believe how cute this is! Love, Love, Love it! Your work is amazing! !